More than 90 new jobs have been created for people in Ipswich by the new B&M store which opened at Anglia Retail Park, bosses have said. 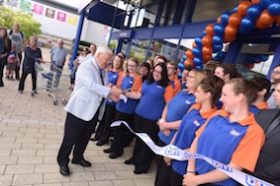 Deputy mayor Roger Fern along with volunteers from Lighthouse Women’s Aid cut the ribbon at the shop when it officially opened its doors at 9am on Friday 23 June. New employees were asked to nominate a charity they think deserves to be given some VIP treatment for the work they carry out in the community. The team received £250 worth of B&M vouchers as a thank you for taking part in the opening ceremony.